The nose has fudge, vanilla, butterscotch, and a hint of blackcurrant. The mouthfeel is thin with no cling. 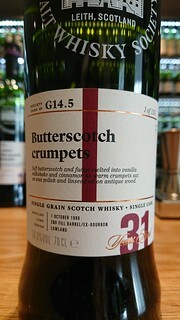 The body has vanilla, buttered crumpets, butterscotch, cinnamon and hints of old polished furniture. The finish has vanilla, cinnamon and butterscotch. It builds to add more cinnamon and buttered crumpets with repeated tastings - no at all unpleasant. Water brings out thin, compact whorling that spreads out and dissipates without mottling. The nose gains old polished furniture and loses the blackcurrant. The body gains more polished oak and hints of blackcurrant, and loses the cinnamon somewhat. It also becomes a little more viscous, which is delightful. The finish gains polished oak furniture and the cinnamon is reduced. A delightful aged grain that shows why this distillery’s spirit was highly regarded by blenders. The change with water is welcome, especially that viscosity - it suddenly rolls around on the tongue most pleasantly. This is grain whisky at its finest. Personal preference: I’d like more than one bottle.